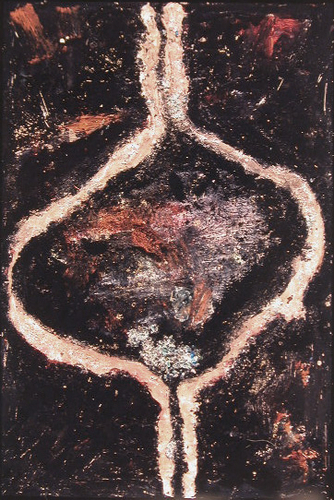 Acrylic on canvas with paper, fiber & river stones. 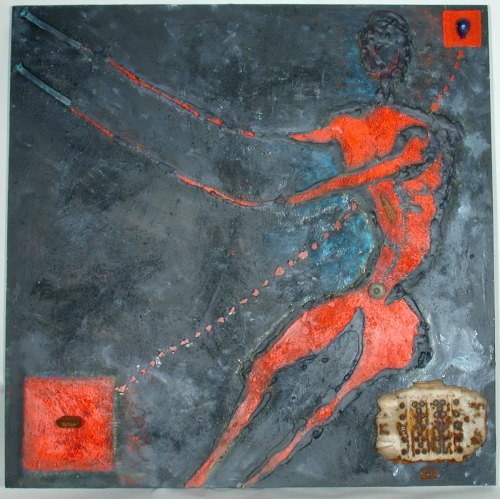 Acrylic on canvas with metal pieces, shale and wire. The painting goes off the canvas. 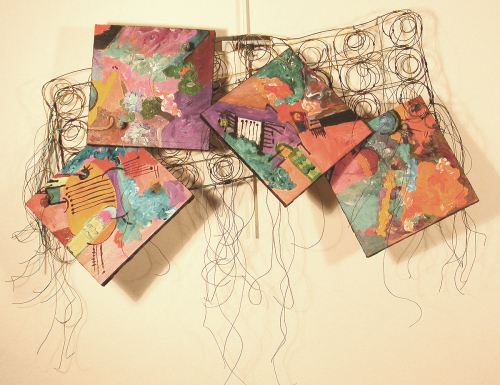 Four acrylic abstract canvases mounted on a section of a mattress spring with telephone wires dangling from the mattress spring. 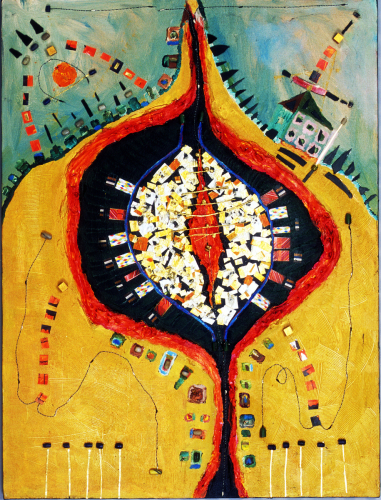 Oil, acrylic, fiber and found objects on canvas. 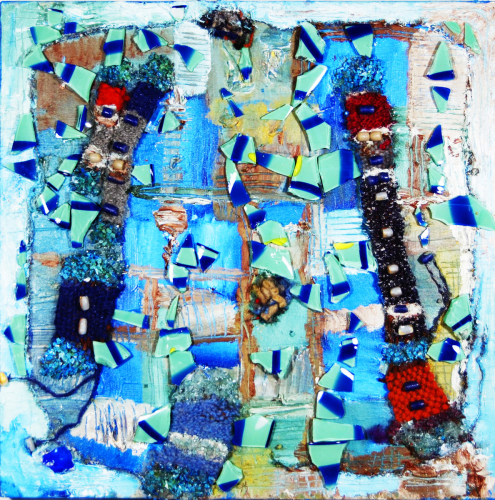 An acrylic painting made of glass pieces, glass beads, woven sections and found objects. 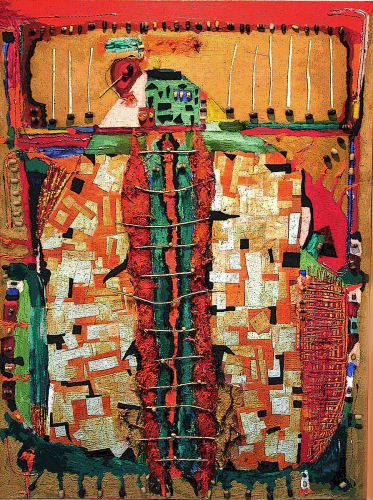 Acrylic painting on canvas with paper, fiber, glass beads, sticks. 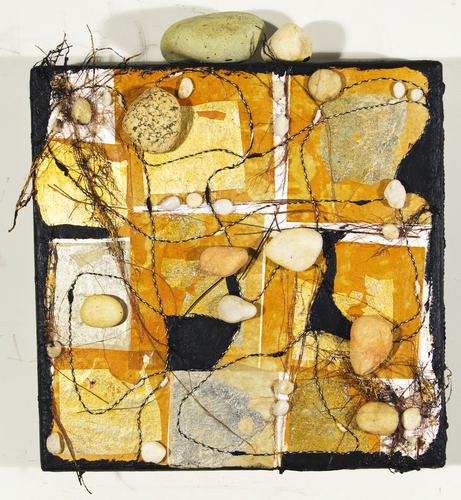 Acrylic on canvas with paper, fiber, beads, sticks and glass pieces. 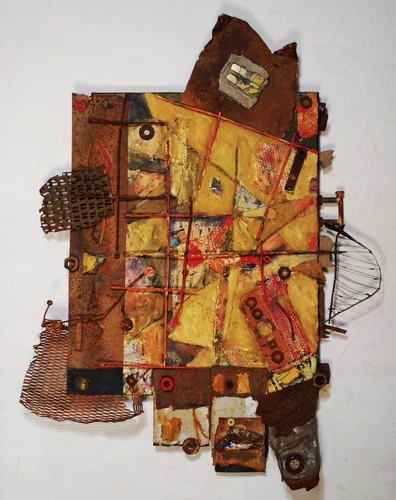 Three dimensional construction on canvas with found objects, paper, fiber, glass, wood and lots of metal objects. 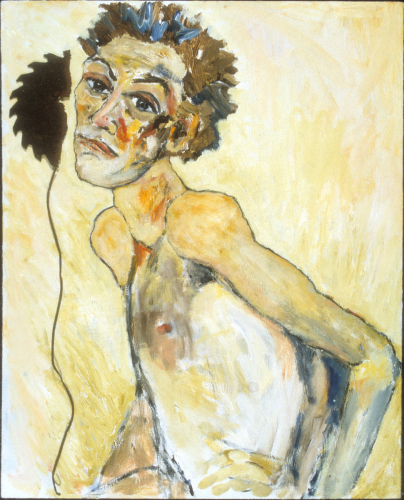 The piece extends beyond the canvas. 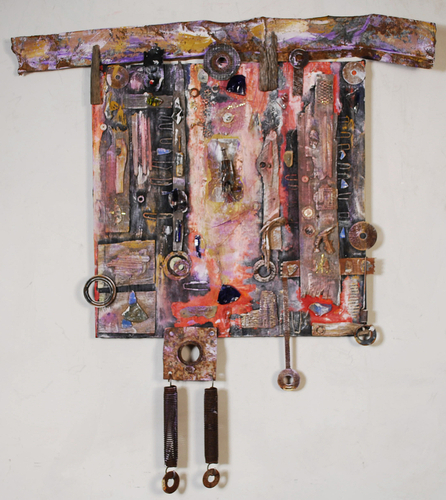 Construction on canvas with acrylic & oil and lots of metal objects, fiber. A great variety of unique and singular and sometimes outlandish objects. 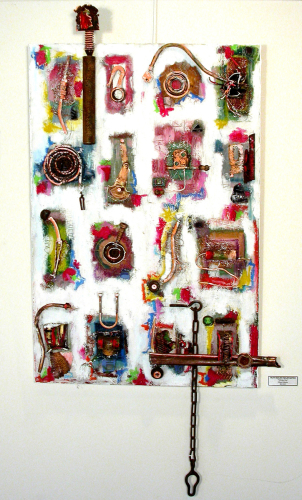 Metal object such as copper wire, pipes, nails, heavy metal chains, beads, sand on canvas with acrylic & oil. Acrylic painting on canvas with a three dimensional metal flower. 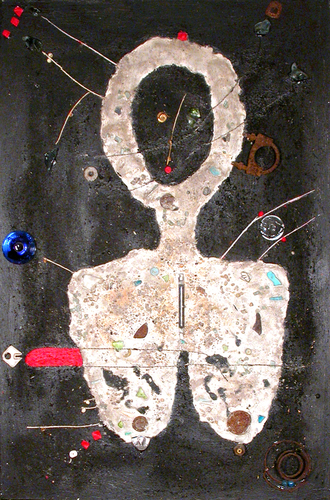 Acrylic mixed Media with cement, small pieces of metal objects, glass, beads and wires and sticks. 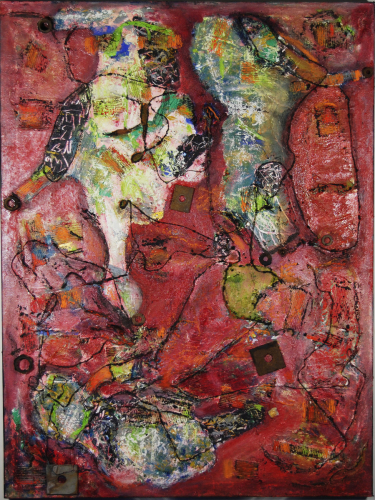 Acrylic and cement on canvas with glass pieces and found objects. Acrylic painting on multiple canvases. 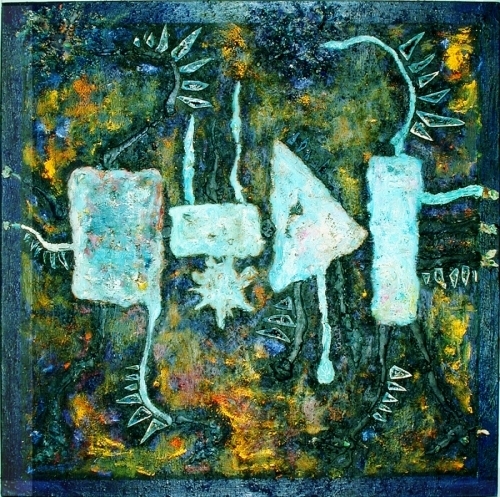 Acrylic painting on gallery wrap canvas painted with cement using glass and found objects. 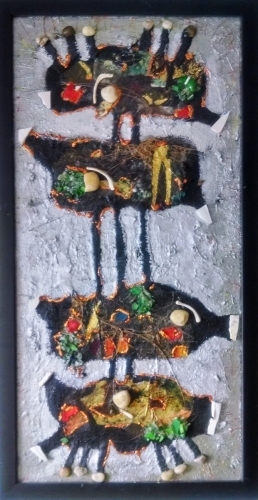 Acrylic with cement, glass pieces and found objects. 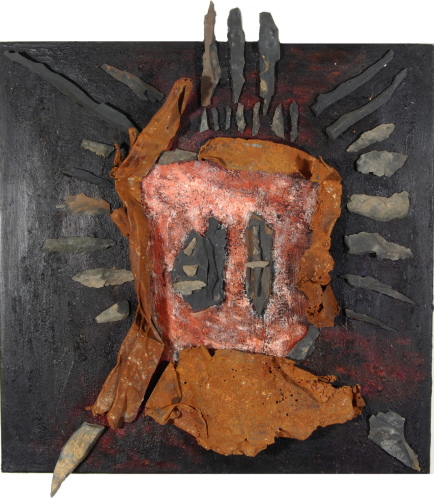 Acrylic on canvas with cement, glass pieces and found objects. 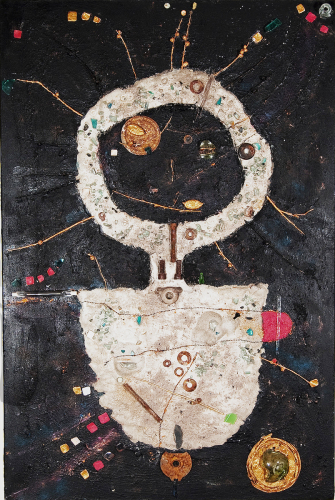 Acrylic on canvas with textured cement, glass pieces and found objects. 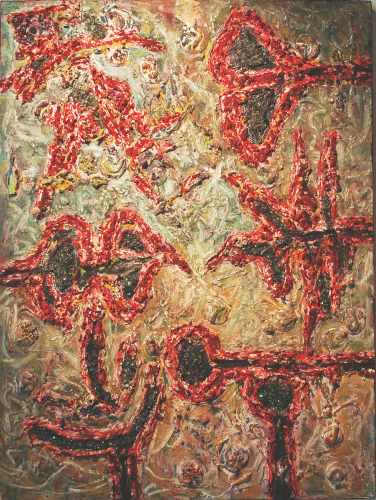 Acrylic painting on multiple canvases of three different sizes. 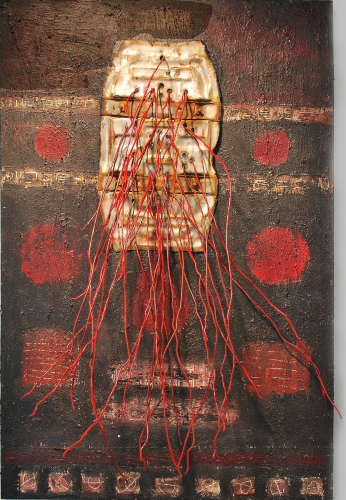 Acrylic painting on canvas with recycled metal wire.